Back in the old homesteading days (and even in some modern-day cultures), it was important to preserve eggs during the summer months since hens will decrease (or stop) their egg production in winter. It was an important part of survival to preserve eggs during more bountiful times for those leaner times, especially out on the prairie where other people were few and far between. After all, backyard chickens won’t lay eggs forever – just when there’s enough light. As modern day homesteaders, even though eggs are available year round at the store (they’re typically old, from unethical sources, and these eggs do go bad after a while), you might wonder how to preserve some of your farm fresh eggs for winter use. 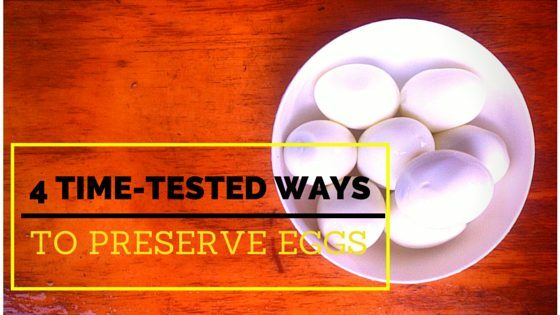 Here’s some time tested techniques to preserve your eggs, along with quotes from old time sources! Just remember: before bothering to preserve any eggs, if you’re unsure whether the egg is fresh or not, try the egg float test to confirm. Also remember: the quality of the egg depends on the quality of what chickens eat. So be sure to give them a high quality diet! This is my personal favorite method. To pickle eggs, you preserve peeled, hard boiled eggs in a vinegar brine solution, mixed with spices. Some people pickle them with beets, so the preserved eggs get a beautiful red color, and others prefer to use turmeric so the beets get an orange or yellow color. Each way yields a different flavor too! To make the pickling brine, mix 4 cups of vinegar with your spices. 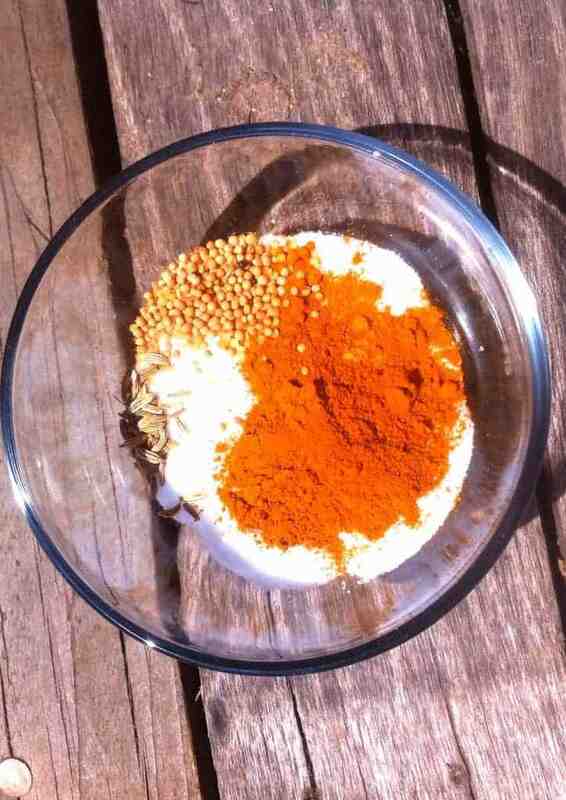 You can use any spices you like. I prefer turmeric, peppercorns, and mustard seed. Heat the vinegar/spice mixture to a boil, and simmer for 5 minutes. Cool your mixture (important to prevent the glass from breaking), and pour over the hard boiled eggs. Allow 4 weeks in the refrigerator for your pickled eggs to absorb all the seasonings. The pickled eggs will remain preserved in your fridge for 3-4 months. Fresh eggs are the best to use for pickling to ensure the highest quality possible since the eggs will be stored over a relatively long period of time. While I understand that refrigerating is not preserving for long term storage (for example, on a shelf for years), you’re still using your excess eggs in a great way, and they’ll keep for months when pickled. My research about canning has been inconclusive. 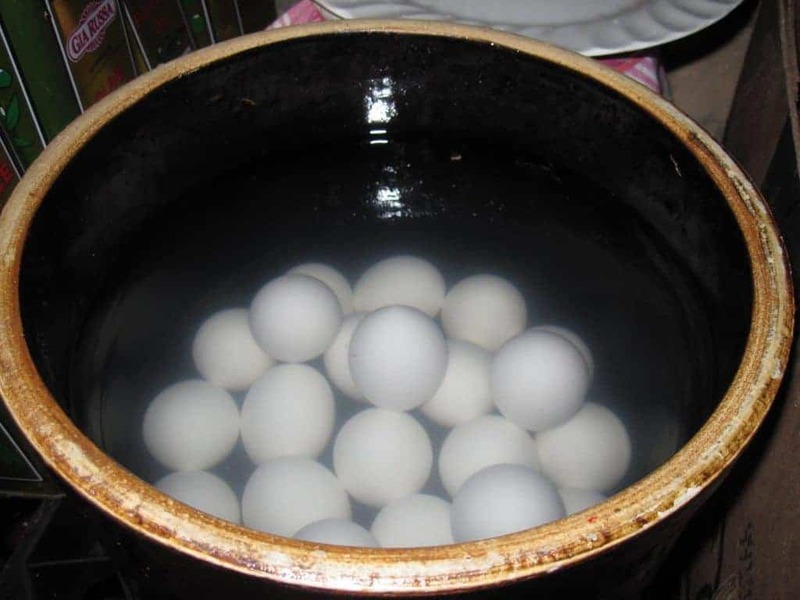 Here’s a couple links about how to can pickled eggs at the end of this article, but some sources say to not can eggs, while others endorse it. My own conclusion, until I’ve tested it out myself, is to proceed at your own risk. Whether you decide to can them or not, pickled eggs will do well in the refrigerator, and definitely taste great. I don’t personally can eggs because eggs don’t usually last too long at our place. If we find ourselves in excess, we simply pickle them to make them last longer, or hatch the eggs to increase our chicken flock for meat or to sell the chicks (or I freeze them for use later). Water glass was a prevelant method to preserve eggs until the early 20th century, in particular in rural areas, before electricity was widely available. Its use has fallen off, but you can still preserve eggs using it. What is water glass? It’s the street name for sodium silicate, which has been used with wide success to preserve eggs. Imagine being able to pull blue eggs from your Ameraucana, Easter Egger, or Araucana chickens – even in the dead of winter! How fun! It works because the bacteria that would enter the egg to spoil it are kept out by the mixture. To learn about how to use water glass to preserve eggs, I referred to my friend, Katherine, who writes at Granny Miller, and is an expert on this subject. Boil your water before mixing it with the sodium silicate (in fact, many recipes advise to use rainwater, although boiled tap should be fine). Allow the water to cool completely before adding the water glass. Once you’ve made your mixture, pour it into a sterilized ceramic crock or plastic bucket (avoid metal). Sterilize your vessel by cleaning it with boiling water – you want to kill any bacteria, yeasts or other yuckies that might lurk there. The mixture needs to be completely cool before adding eggs (so the eggs aren’t cooked). Add the eggs pointed side down – you can add as many eggs as you like (storing pointed end down) but be careful not to stack the eggs too high and cause the bottom ones to crack. Leave 2″-3″ of liquid above the eggs, and make sure the vessel is covered tightly. Store in a cool area. You can add fresh eggs daily to the crock – but be sure to never use store bought eggs or eggs that have been washed. They won’t store well, and could ruin your entire harvest. Some people don’t like this method because they don’t want to ingest sodium silicate – it’s completely up to you. Sodium silicate is a naturally occurring mineral, and there’s been no reports of it being unsafe to consume. If you want to use it to preserve eggs, it’s up to you. One common modern-day method to preserve eggs is to freeze them. There’s a couple different methods to this, each with advantages and disadvantages. To freeze your eggs, you can crack them into an egg tray, cover with plastic (in case it spills before freezing) then place in your freezer. You should be able to stack ice trays as needed. Now that you know how to freeze an egg, you have a couple choices. You can either scramble the yolks and whites together, which has the advantage of better consistency. You can also preserve your eggs by freezing with the yolk intact – it’s up to you. 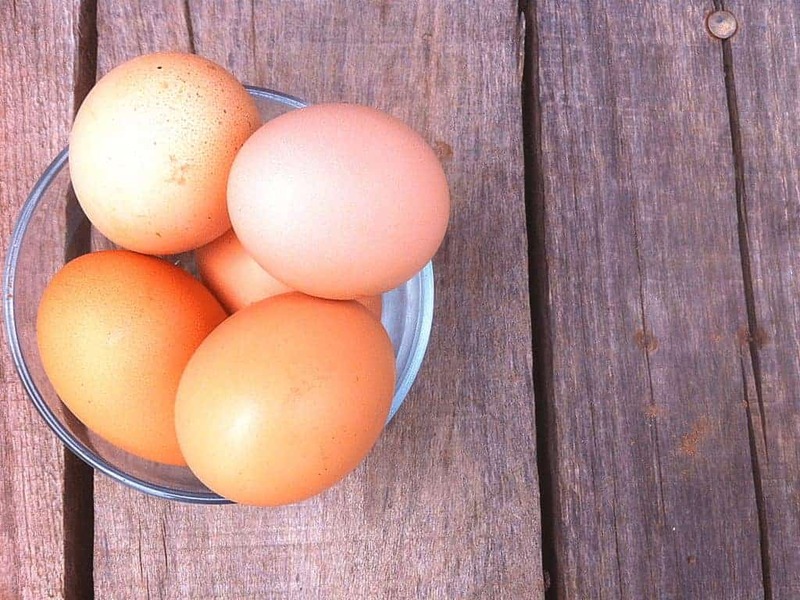 One popular modern day method to preserve eggs without refrigeration is using mineral oil. Perky Prepping Grandma has a great article about using mineral oil to preserve eggs. Using about a tablespoon of mineral oil for 18 eggs (that means that bottle of mineral oil will last a while – very frugal! ), slather a layer of the oil onto the eggshell. Store back in the container, pointy side down to preserve. You can refrigerate at this point, or put in a cool, dark area. Turn the eggs over once a month to keep the yolks from settling. You must use mineral oil – other oils won’t work to preserve eggs. They will go bad, and so will your eggs you worked so hard to store. However (and this is a relatively important however), unslacked lime can cause problems with humans when inhaled, so I don’t recommend it as a resource to preserve eggs. And then there’s Thousand Year Eggs. 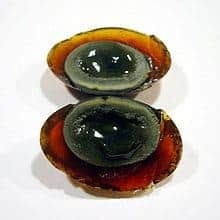 Considered a delicacy in China, they’re actually preserved for about 100 days – “Thousand Year” is just a romantic term. Although there are a few recipes floating around out there, the general consensus is it’s a mixture of salt, black tea, ashes, and lime. 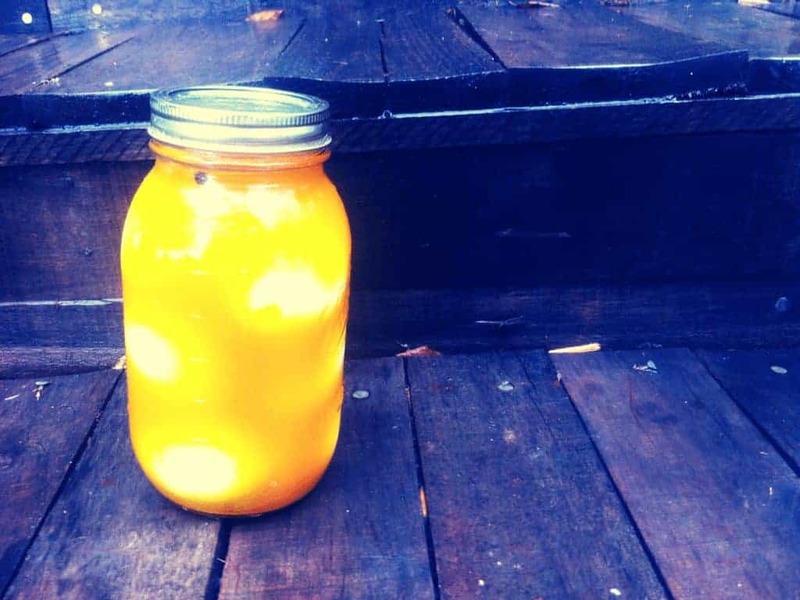 Here’s one recipe to preserve eggs in this way. The eggs are then coated in the mixture, and placed in a crock in a cool, dark area to preserve. However, modern Thousand Year Eggs can be full of toxic chemicals used to speed up the preserving process, so skip them unless you’ve concocted them yourself. I hope this article helps you preserve your eggs in time of bounty for those times when fresh eggs aren’t readily accessible! Which do you think you’ll try? Comment below! Great post! I’ve never really thought to preserve eggs but I can see this being a very useful skill to have when I get chickens. Thank you so much for sharing. I really like your blog, it is interesting to see a frugal blog with an agricultural spin on it. Definitely don’t see that too often if not at all! Great article….I have been using the mineral oil method for 7-8 years now. 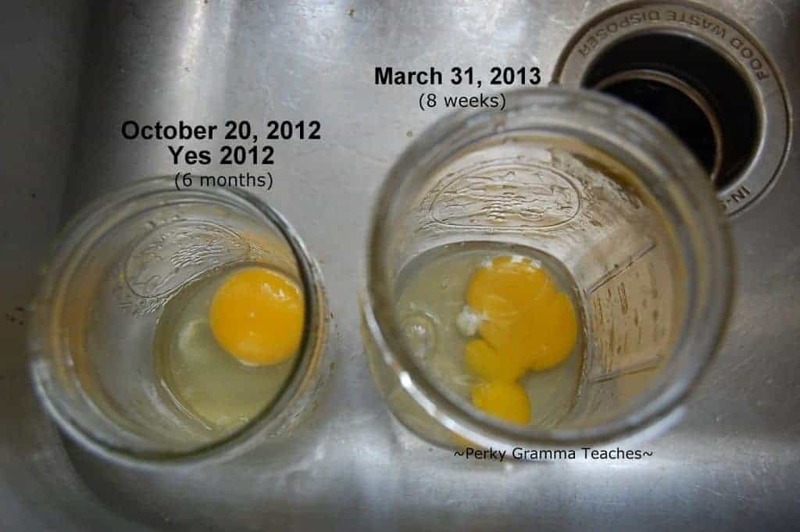 I have used eggs that were preserved for 9 months with no problem. The very occasional bad egg…is readily noticed when it is cracked open…your nose will immediately tell you! I wear food handling gloves to coat the eggs, as i read somewhere that mineral oil causes some kind of adverse effect with estrogen or something…I don’t really know if I believe that, but it’s easy enough to wear those cheap gloves.